Don’t hate me but I’m one of the lucky Moms who never ended up with stretch marks from my two pregnancies. But before you go throwing tomatoes, know that I have two c-section scars. So we’re even, okay? And making you even happier, there’s a product that can help with stretch marks. Apothederm is a skin care company that makes Stretch Mark Vanishing Cream. I won’t pretend to understand how it works but the folks at Apothederm have come up with the right combination of ingredients to make sure your stretch marks disappear into your memory only in two weeks time. 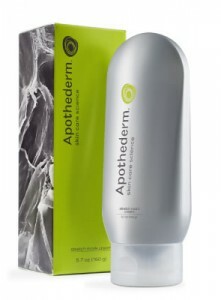 You can purchase a 5.7 oz bottle on Apothederm.com for $89.95. Disclosure: This post is one in a series of posts sponsored by “All about the Bump Month” for the month of May. To visit the sponsor page please click here. That sounds amazing, I’ve never heard of it. I’m the same I got no stretch marks (but I did moisturise with cocoa butter religiously) and had c-section!